Redevelopment of 711 Irving Street is Interesting | Park View, D.C. 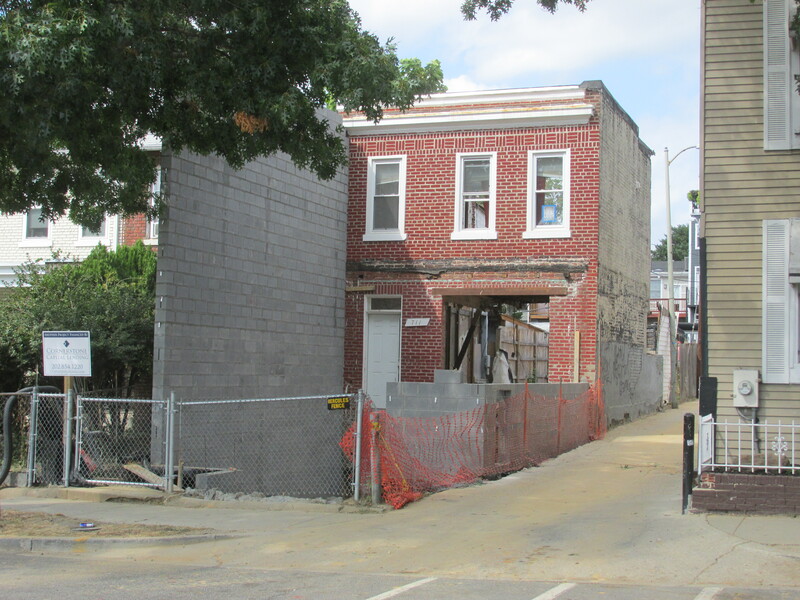 I had a number of people reach out to me after seeing the construction at the rowhouse at 711 Irving Street, NW. 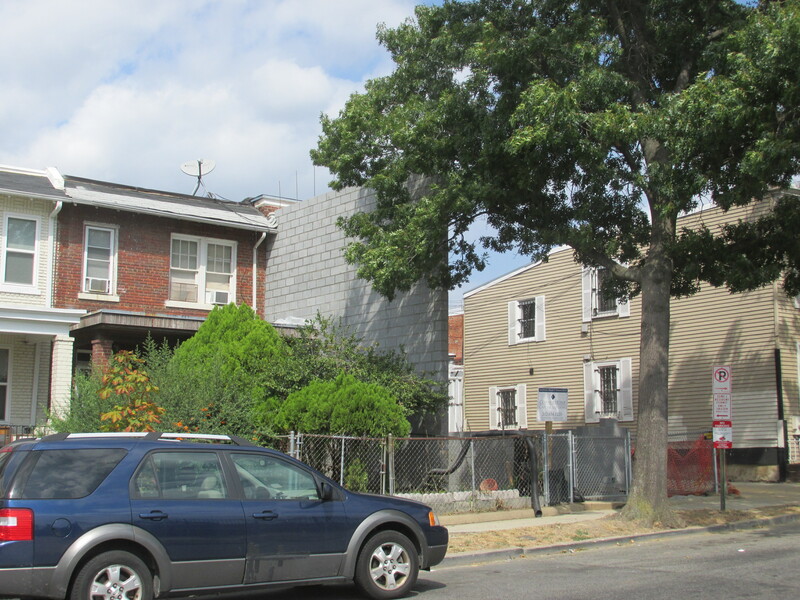 In looking over the site, it appears that very little of the original house will be retained, and in reviewing the plan that is available at the DCRA Website along with a determination letter and other drawings, what little is standing today probably won’t be retained once it is encased. Anyway, that would be my guess as the floorplans show open plan layouts. What is interesting to me is that the very deep lot is essentially being developed so that a new single family home will sit on the front of the lot with a new single family home constructed on the back of the lot. What will keep the structures from being considered two structures is a hallway connector that allows the entrance of the rear building to be located on Irving. The project appears to have been approved under the old zoning regulations. Overall, I think it is interesting that by bringing the building forward it is more in line with the properties to its east on the other side of the alley. It also won’t seem so different from its neighbors when construction begins across the street for the redevelopment of Park Morton. Below is the perspective of the new building from the DCRA Website. This entry was posted on September 19, 2016 at 7:01 am and is filed under Development, Housing. You can subscribe via RSS 2.0 feed to this post's comments. I think it looks great; hope they are preserving that big tree in front. Kent – you said that the front and the back segments each will be a single-family home. Wow. A four-story single-family home x2. I wonder if this is the next new thing — taking a single-family home and turning it into…a single-family home (x2) about 3 times the size of the original (at an exorbitant price point, no doubt). Interesting. This is awful. Built in complete disregard to neighbors. I hope that at the very least they don’t leave that horrible cinder block wall exposed – as other inconsiderate pop-ups have done over in Lanier Heights and Shaw. I’m fine with building on top of existing stock in order to increase housing – but developers should do so with at least a modicum of integrity and respect for both the community and architectural surroundings. So far, this developer doesn’t seem to have either. I live in one of the developer’s previous projects. They maintained the overall feel of the neighborhood while increasing the available housing stock in the neighborhood, provided amazing service and gave us what I believe to be a reasonable deal for the size of the home. Utilizing both the front and back of the lot enables the developer to maximize his profit (the goal of his business) while also providing the best of both worlds for the residents regarding single-family and condo living. This is exactly the kind of intelligent development the neighborhood needs. My one hope is that they choose an appropriate finish for the cinderblock side that abuts the neighboring property (hopefully stucco or siding panels), but otherwise I must say kudos to the developer for maximizing the space out of this very deep lot. It certainly won’t “seem” different, because you won’t even be able to see it if the outrageously large and unnecessary structure that is being proposed (not a done deal) will block it from view, and the sun!